Real Housewives of Dallas, y’all. I need some kind of conspiracy theorist’s chart riddled with news clippings, string, and photographs to keep up with all the alliance hopping…or at the very least a decent Pinterest inspired bullet journal to follow all of the craziness. Season two created a conundrum for me. As annoying as I found most all of the cast in some ways, they were all likable in other ways, save for Kameron Westcott’s forced valley girl dialect. LeeAnne Locken was the clear villain last year, but she showed true moments of vulnerability when paired with her best friend, newbie D’Andra Simmons…until she kept threatening people’s life with her JUST HANDS. Sheesh. Brandi Redmond and Stephanie Hollman’s reconciliation was a moment of realness, the likes of which Bravo viewers haven’t seen since the early seasons of RHOC–you know, when the franchise was less about drama and more about real life. Being the new franchise on the block, Dallas delivered a bit more reality and a bit less manufactured shock factor. Unfortunately, their reality was all shock factor, and Brandi hopes she’s learned from it, at least a little. Season two of Real Housewives of Dallas flew by in a whirlwind of funnel cakes, death threats, pink dog food and constant eye rolls and insults regarding class and zip codes. Looking back, I’m not really sure how I feel about it all, but newcomer D’Andra Simmons does. In her latest blog, she addresses her ride or die loyalty to Just Hands while calling out the “brunch bashers” for their bad behavior. She begins, “We have come to an end of the season, and I have to say, I am a little melancholy. Luckily we still have a drama filled reunion, but it feels so strange that I won’t be rushing home from work or an event staring at the TV screen at 9PM CST watching The Real Housewives of Dallas with everyone and reacting to the Twitter feed. It has been a crazy fun-filled and rewarding ride. I started this season not knowing what to expect from this journey. It was rough at times, but in the end I am truly glad I decided to take this plunge. My year ended with so many blessings and new opportunities, even in the midst of so much tension. My friendship with LeeAnne Locken has remained strong, although, I never questioned it from the get-go. I found my place among a group of ladies that are still trying to find themselves, and I never lost my identity. I stayed true to who I am. Love me or hate me, I am always the same person, whether that is on camera or in private. My mom and I faced our conflicts head on, and I was able to prove to her that I am ready and able to take over the family business. I now have a company of my own and a bright future full of promise that is truly mine to create. My bestie is finally engaged, and I am excited to help her plan her wedding and a few parties in between. Unfortunately, it looks like our guest list may be shrinking!” Um, you think? LeeAnne and D’Andra Simmons are engagement party planning. There is a theme and a surprise! I’m friends with LeeAnne its carnival-themed! It’s going to be more Cirque du Soleil than county fair. Keeping it classy people! Expect an eatable cotton candy wall and a “lounge pocket”, whatever that is. D’Andra is all too excited to plan a follow-up engagement brunch for the day after. Even Mama Dee Simmons approves of LeeAnne and Rich, but she’s got a date the night of the party, so don’t expect to see her. Speaking of moms, we find out that LeeAnne’s mama is coming. We’re told she and LeeAnne are estranged and LeeAnne is hoping for a resolution. Well what do you know–a housewife is expressing remorse over her actions! Is there a blue moon tonight? Did a pig just fly by my window? Brandi Redmond feels downright horrible for insinuating her friend and Real Housewives of Dallas cohort was shagging Dr. Dueber when she was a nanny for her now-stepchildren. Following? I’m sure LeeAnne Locken will end up as somewhat culpable, but at least she’ll own it, right? 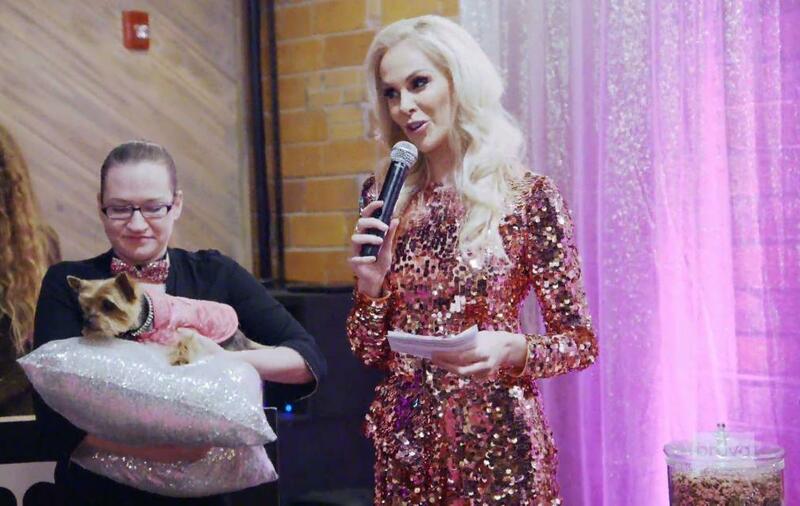 In her blog, Brandi apologizes for her White Party accusations against Cary Dueber and hopes to explain some of what viewers may have missed in the glass throwing mayhem and subsequent pink kibble craziness. She begins, “Thank you all again for watching and keeping up with all our shenanigans. First, as I write this, my eyes are overwhelmingly pouring with tears. I am truly sorry for the pain, heartache, and embarrassment I’ve caused the Deuber family. I love and respect the family as my friends and their practice. I have never done something so low and hurtful in my life. Not only am I disappointed in myself, but I can’t imagine how people must feel that are constantly on the move to bring others down. It’s exhausting, and my soul is beyond empty for that darkness I created. I know time heals all things, and my prayers are for healing the Deuber family and myself so that I never let anyone down that I love and care about.” Sounds pretty sincere, I’d say! This episode picks up with Stephanie Hollman patiently teaching her son the alphabet with a Tutor. She’s happy to see that his confidence is growing and feels good about his progress. Later, we learn that her husband Travis also suffered from dyslexia growing up. And now he’s a multi-millionaire. Stephanie smiles as she realizes that her son is going to be just fine.